Would Celestial Dawn combo with Emeria, the Sky Ruin? How are non-basic lands treated? My Odric deck. You might get some ideas from it. Your land base needs a bit of work: Emeria, The Sky Ruin , Nykthos, Shrine to Nyx and Rogue's Passage should be auto includes. Spear of Heliod is good for deterring attackers. 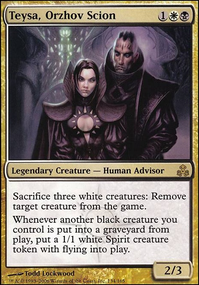 While I agree you would not want the entire cast I mentioned before I do think that both Leonin Shikari and Balan, Wandering Knight would add a great deal to the deck with Balan being a good backup if people keep removing Kimba. A couple of artifact mentions worth looking at is Brass Squire and Semblance Anvil for speeding up the pain train. 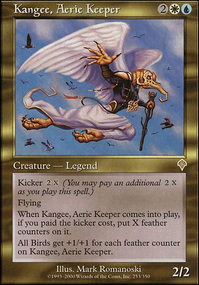 Also look at Emeria, The Sky Ruin as it provides a very low cost opportunity for repeatable resurrection for creatures to the deck. I am assuming by your list that you don't have an Enlightened Tutor or that its currently out of budget, but if you are able to acquire one I think its one of the few cards you do not have that is close to a must have. 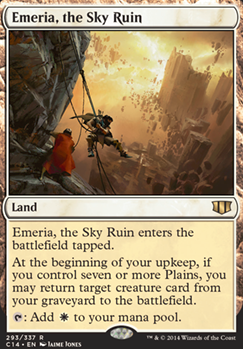 If you want a very nice value land for the late game, try Emeria, The Sky Ruin . Very nice list, brewing him myself. Hope he’s fun to play! Yeh I find Emeria, The Sky Ruin works wonders, alot of the time it comes down early and your opponents just forget about it (you can always play it down as well "its 5 land drops away thats 5 turns from now" stuff like that but with the amount of ramp in the deck you can get it online early). God-Pharaoh's Gift is maybe just a bit high variance, I did win a game recently off the back of it. If I'm being honest though God-Pharaoh's Gift does get stuck in my hand alot it costs a ton, where as Emeria, The Sky Ruin you can just kind of drop it down and forget about it. Your mana base was quite good not alot of tapped lands so you shouldnt be punished by Emeria, The Sky Ruin having to come into play tapped. How has Emeria, The Sky Ruin been for you? I've been looking into it as a replacement for God-Pharaoh's Gift which has been under-performing for me as of late. My list is here for reference. I have a reworked manabase in my current IRL version, just looking to see if Emeria is worth it first. Okay, so I think you're missing the point a little. This deck is meant to be good against specifically Goblins, and no other matchup was taken into consideration when building it; everything you're saying is true and I agree with you on all of those points, but please remember that the request was to make the best possible deck against Goblins, which is why there are some unorthodox card selections here. That being the case, Circle of Protection: Red is in the deck because I'm assuming the matchup will always be Goblins, where it is always good. That assumption also applies to Burrenton Forge-Tender , Kami of False Hope , and the Soul Sisters. Soul Sisters and Martyr Proc are, indeed, different decks. I suppose I should've mentioned this earlier, but this is a mashup of those two different archetypes. The reason I built it that way was to get the best cards available against Goblins; to get the best of both worlds, if you will. To clarify in further detail, the deck is playing Soul Sisters alongside Martyr of Sands because Goblins plays lots of creatures that trigger them. Another reason is because tokens are good at blocking (though they are worse against Legion Loyalist ) as well as gaining life with the soul sisters. The deck isn't playing sweepers because it has a higher density of creatures than normal Martyr Proc (to support the Soul Sisters). I put that thing about sweepers in a note in the non-budget version of this deck (which, by the way, also includes the "infinite value loop" involving Mistveil Plains / Emeria, The Sky Ruin / Ranger of Eos ). This deck isn't playing GQ or Field of Ruin because it's trying to stay at the $70 budget. Yes I've been playing this deck every chance I get! Basically every up-date I've done on this deck has been because after play testing it and realizing what I need to change or just new cards I have acquired. So right now I currently own all these cards expect some of the special lands. I just order them on tcgplayer. Mistveil Plains and Emeria, The Sky Ruin is a must for me, however I'm wondering if having to many special lands is going to be a bad thing. 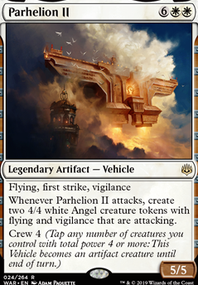 heyzeus_ I see your point on Lumbering Battlement where it would just be better for me to drop an angel rather using it only for board wipe protections, so instead I replaced it with Steelshaper's Gift . I also swapped Angelheart Vial for Coercive Portal because it grants me two things which is the chance to draw or a board wipe which is what i'm after. None of my friends take extra turns so it makes sense to actually not have Ugin's Nexus in this deck because there are defiantly stronger cards that i have. Honestly I'm having a hard time trying to figure out what else to add besides expensive cards such as Land Tax , Admonition Angel , Avacyn, Angel of Hope , Archangel of Thune , Stoneforge Mystic , Linvala, Keeper of Silence , Angel of Jubilation , The Immortal Sun , Baneslayer Angel , Crucible of Worlds , and maybe Angel of Grace . But in my eyes these are the big buys that 10 dollars or up which probably wont get in tell summer.